We has a hard time finding the Stahahe High Peak Trail from the Stahahe approach, as its not an official trail and is unmarked. 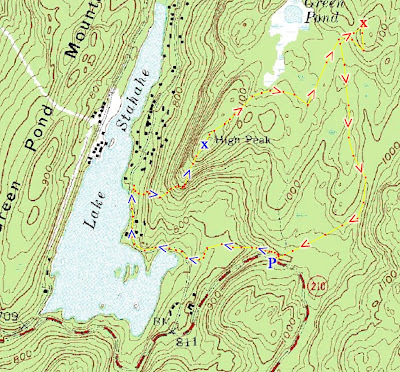 My older trail conference maps have the unmarked trail but the newer editions of the map don't show this part of the trail from the Stahahe approach. We found the general area of the trail, and started heading up the mountain using a little bit of guesswork to maintain the route up the mountain. There are some sporadic "homemade" red blazes which were helpful in maintaining the route. Near the top is a short but sweet scramble. Once at the top we were afforded and absolutely magnificent view. This is one of the best views in Harriman! (I know I have said this line countless times before on many different trails...) The view is unobstructed with miles of mountains and hills, with excellent views of Harriman, Sterling Forest, and Lake Stahahe directly below. We continued along the trail - at this point it is much better maintained. (I would recommend if you take this route on your own to do it from Island Pond Road as its a much easier route.) We continued until Island Pond Road, which is an old abandoned mining road that is now used as a hiking trail, and went north on Island Pond Road until we hit the Boston Mine (right after the Nurian and Dunning Trails). The Boston Mine is one of the civil-war era iron mines in the region, with extensive deposits of rough magnetite iron ore in the dumps. This particular mine has a very impressive cut in the rock and has a deep hole. We ventured into the mine scrambling around on rocks in the water to take some good photos inside the mine. After exploring the mine we headed back south on the Nurian Trail, continued where it intesected with the WB Trail (did this small stretch last week), and then continued along the WB back to our car at the trailhead. Me sitting atop the upper waterfall. where the stream enters in. I climbed High Peak many times as a child, as the sleepaway camp I went to evey year is at the base. Even camped overnight there once in 1970. If you would have started from the base by the camp, the trail is (or at least was) clearly marked. However, you would not have found the Mine, which I never saw. Glad you had a good time. The views are magnificient. Yeah, the trail looks like it once was well-used but is now worn out. 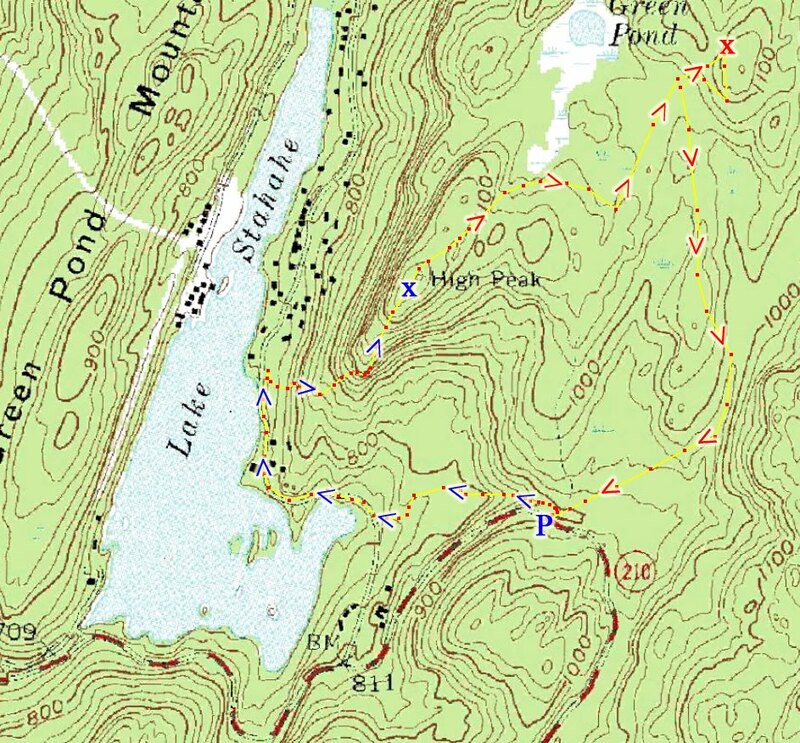 The earlier version of the NY/NJ Trail conference maps had the unmarked trail shown on the map, while the newer map versions (at least the 2008 version) did not have it.